We are one of the world's leading quality providers of large pitch chains used on the camshaft drive systems of two-stroke marine engine drive producers worldwide. Mega Link Chains (I) Pvt. 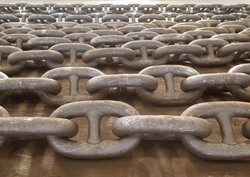 Ltd.
We are supplier and Exporter all types of used/reconditioned/reusable/second hand Marine Ship Chain like studlink chain, studless chain, weak link, 3 link adaptor chain, 5 link adaptor chain, 8 link adaptor chain, etc ship ycling yard ALANG, INDIA. Renold is one of the world's leading quality providers of large pitch chains used on the camshaft drive systems of two-stroke marine engine drive producers worldwide. 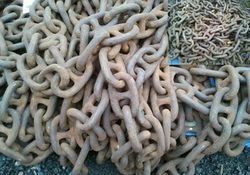 Our firm offers a varied range of Marine Chains. Professionals develop this product as per worldwide industry standards. We offer this product at nominal costs. For all your ship chandling requirements welcome to MB Traders, we are a new generation ship chandlers supply vessels with provisions, deck and engine stores etc.